Don't miss this deal!! If you have a dance, wedding or other special event coming up this year - make sure to browse around these deals today! Amazon is offering 50-70% Off Prom Dresses, Shoes and More! Best of all they do have a Under $50 category to browse. Today ONLY - snag this Salton Harley Pastenak 64-oz Blender for $99.99 (Retail $249.99). Salton Harley Pasternak 64-Oz. Blender: Start preparing delicious beverages, soups and sauces in minutes with this versatile blender, which lets you blend, crush, emulsify, chop and purée ingredients. You can prepare drinks in the 2L BPA-free Tritan Vortex jar, then pour some into the 24-oz. bottle to take on the go. The 2L BPA-free Tritan Vortex jar features a cloverleaf shape and a curved bottom to help eliminate pockets of unblended food. An included 24-oz. on-the-go bottle lets you take drinks with you. You can blend, crush, emulsify, chop, purée and liquefy ingredients depending on your needs. A 2HP, 1500W motor with variable speed control and pulse lets you turn ice into snow. 8 stainless steel blades efficiently cut through fruits, vegetables and nuts. Today on Amazon - Save Up To 50% Off Select Baseball and Softball Training Equipment. 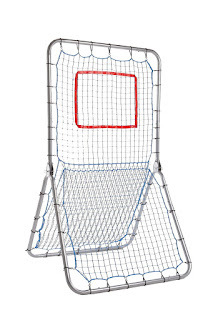 We love the Champion Sports Multi-Sport Net Pitch Back Screen for $49.99 (Retail $99.99). 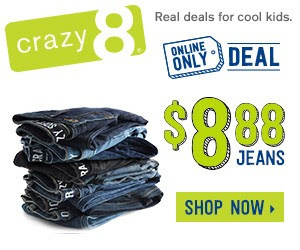 Right now Crazy 8 is offering $8.88 Jeans until February 28th. Plus More! Head over and shop all the HOT deals! 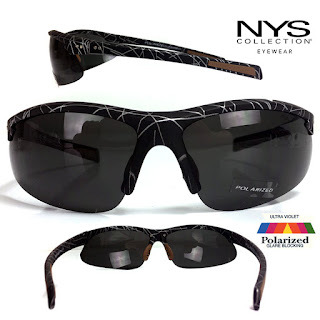 If you are looking for a great deal on sunglasses, right now you can get this 2 Pack of Polarized Sport Sunglasses by NYS Collection - 2 Pairs for $10 or 4 Pairs for $18! Plus, shipping is free! In need of a Custom Grocery Tote for just $1.99? Use Code: PRODUCE. S&amp;H Not Included. Order Quantity Limited to 1. Ordered Online. One Time Use. Cannot Combine Coupon Codes. Offer For New Customers Only. Exp. 03-19–2016. Hurry over and check out this Merry Garden Kids Wooden Picnic Table for $42.99 (Retail $79.99). May be painted or stained in any color! 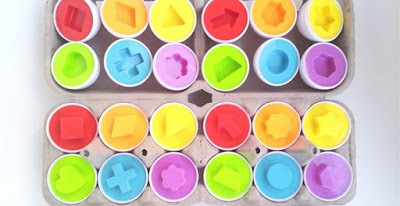 Here's a fun little Easter Activity for the kiddos ONLY $8.99. Each activity set includes ALL the following inventories for a matching game and a artwork activity. 1. Blinding - Cover the eyes of the kids, ask them to put back the matching-pieces together in a egg simply by feeling the shapes. You could also do it by putting the matching-pieces in a bag (as soon as the kids can't see the pieces). 2. Fishing - Face all matching-pieces downward. In each round each kid could face up 2 matching-pieces. They need to memorize the shapes they see so later they could match the correct pieces in their round. The person who matches the most pairs win. Head over and check out these Perfect in Pom Pom | Cover Ups for $14.99 (Retail $34). These cover ups are amazing! We are just going crazy for pom poms and tassles this summer! Also check out Crochet Detail Poncho Cover Up | 2 Colors $14.99 (Retail $32). Adorable mint cover up with gorgeous crochet lace detail on the front and along the edges. Stunning details and in the hottest color of the Summer!